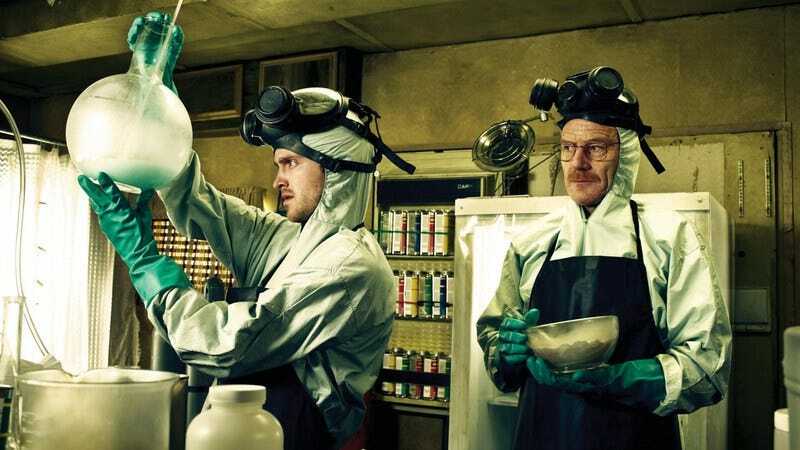 Aaron Paul and Bryan Cranston man up and make some meth in Breaking Bad. Sony’s PlayStation is working with Breaking Bad creator Vince Gilligan to create a non-game virtual reality experience based on the series, Polygon reports, offering an immersive recreation of the show’s world to fans who are too scared to sell meth. There’s no word on when it might be available, other than the fact that it won’t be this year. So you still have until at least 2018 to wait, or to work up the courage to traffic drugs already. Shawn Layden, president of Sony’s video game division, says he recently invited seven of the company’s most accomplished current and former showrunners—including Battlestar Galactica’s Ronald D. Moore, The Walking Dead’s Frank Darabont, and The Blacklist’s David Shore—to tour its VR facility, hoping to inspire them to think of new ways to create within the virtual reality medium. While each producer left excited by what they’d just seen (“To each individual, when they took the headset off, they each shouted an expletive and followed that with, ‘Wow, this just blows up narrative,’” Layden says), only Gilligan was ready to get to work on a Breaking Bad-themed VR experience, recognizing right away that you’re a total pansy who probably won’t even sacrifice your family or welcome the slow erosion of your soul in order to peddle narcotics and sate your own megalomaniacal desires, so he’d better make something so you can just play pretend. Unless you’re just as scared of putting on a VR headset as you are of setting up a meth lab! Christ, what a baby. As the project is still in the early development stages, details are understandably scarce on whether it will involve any of the Breaking Bad cast, whether this will be an episodic or one-off experience, or if you’d probably discover that, once you’ve secured a reliable supplier for pseudoephedrine and a loyal distribution ring, you’d find that manufacturing and selling meth is a lot easier than you initially thought and isn’t even that big a deal, really, so why were you so scared in the first place? Also, the money is great. And the power! Can’t beat the power.